Rectangle ABCD is 70 units long and 40 units wide . Eighteen points (including A and C) are marked on the diagonal AC dividing the diagonal into 17 congruent pieces. Twenty-two points (including A and B) are marked on theside AB dividing the side into 21 congruent pieces. 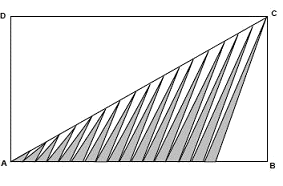 Seventeen non-overlapping triangles are constructed as shown. 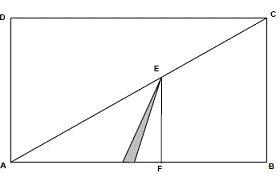 Each triangle has two vertices that are two of these adjacent marked points on the side of the rectangle, and one vertex that is one of the marked points along the diagonal of the rectangle. Only the left 17 of the 21 congruent pieces along the side of the rectangle are used as bases of these triangles.What is the sum of the areas of these 17 triangles in square units? Hence, the required area is 600 squared units.